It’s no surprise: I’ve just lost all of my male followers. But a girl has to do what a girl has to do. And I need to get this off my chest (actually, off my L1 lumbar spine]. Okay, I was stupid. I leaned against a bathroom door that was, much to my surprise and chagrin, not locked—not even securely closed. And I went flying. I landed hard on those unforgiving, uneven Mexican tiles with the wide grout lines—right on my sits’ bones. Yes, I have booty, (“Baby has back”) but, let me tell you, the extra padding was as useless as a down coat in the middle of summer. I not only gave those two bones a ride for their money but felt a crash of upper body meeting lower body like two tectonic plates rumbling for a fight. Today, two weeks after the “event,” I saw a orthopedic guy. I’d done some acupuncture and therapeutic massage but my lower back still hurt. Only yesterday was I able to roll out of bed like I was nine months pregnant instead of a hunched back crone (Think the Witch in “Hansel and Gretel”). A small victory. And, yes, the day before I sat down on the floor for a test drive and managed to stay for more than a minute before bailing. This ortho guy ordered x-rays. And that was good. (The last x-rays I’d had taken were in 2009 for what was possibly a torn meniscus in my left knee. I was sent to rehab and avoided surgery.) This time around, I wasn’t so lucky: I had a compression fracture in L1 that looked like a square piece of chocolate with a bite taken out at the top. Okay, so what did having that 15% fracture have to do with my sacrum? Did he think I’d dropped out of school before eighth grade? Crap! My friend had an MRI not long ago and had to push the panic button twice before settling down to Motown blaring through her headphones. I don’t consider myself claustrophobic, but my friends’ ordeal sent me into panic mode. I now had big time stress and a screaming sacrum. Any woman over, say, sixty-five (How did the folks who established Medicare know?) watches—sometimes, in horror—sometimes, with cool detachment as her estrogen takes a permanent vacation. The mob boss has spoken. Time for a new identity. Changes in skin tone, breasts, stomachs (Need I go on?) 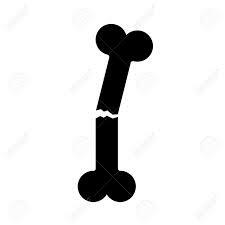 and, oh, yes, brittle bones that fracture or break by just looking at them the wrong way. 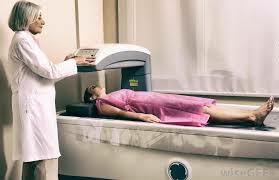 My MRI assistant was a burly, 230-pound man who looked nothing like this lovely blonde. Back to the MRI: it wasn’t as bad as I had fretted. The machine was a new model—wider, higher and faster. While I didn’t get to wear headphones (something about the position of my head) and had to suffer the constant slamming of jack hammers in my brain, I survived without having to push the panic button even once. So, what did the big, bad MRI show that the x-rays did not? Absolutely nothing. The treatment? Time. At least, three months’ worth. Are you kidding? No dance? No yoga? No gardening? No nothing? My patience has already worn as thin as the crepe-paper skin that wrinkles like stuffed paper in a gift bag. But this is no gift. Several friends have suggested medical marijuana—the yummy gummy kind that looks like and tastes like, well, a gummy bear. Unless I steal the medical marijuana get-out-of-jail card from someone who has met all the requirements, I’m out of luck there, too. Here’s to healing. And here’s to the draining of estrogen (Where have I heard the word draining lately?) 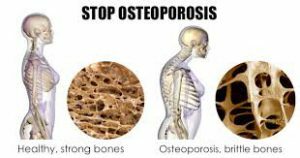 and the reality of osteoporosis. Sadly, all true about the whole aging thing… Take care of yourself. 3-4 months will be over before you know it.